Statement necklaces have been on the scene for a number of months now and they aren’t going anywhere! They are the perfect quick fix to a blah outfit or the key piece when taking your daytime look into evening. A key tip when wearing a statement necklace is to keep the rest of your jewelry to a minimum, don’t let your other jewelry compete. Besides that, statement necklaces go with everything. From a little black dress to layered with a collared shirt and sweater, don’t be afraid to pair a statement necklace with just about anything! Also, layering your statement necklaces can create a beautiful, dramatic look. And don’t worry! Although some necklaces can get very pricey, many just look that way. Scour your local TJ Maxx or eBay like I did for some great finds. 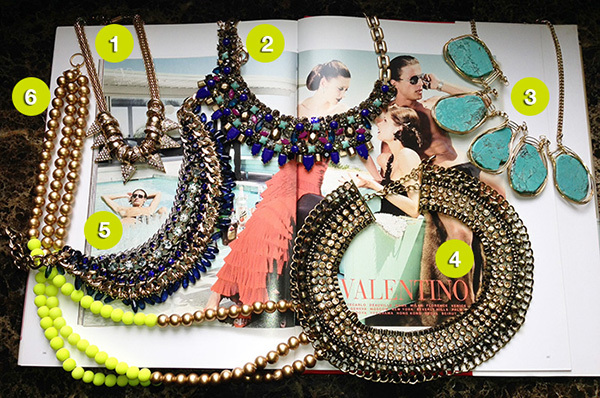 In the cover photo, the big top necklace was $29 and the neon one was only $14! Keep an open mind and get creative!